I got the idea from While You Were Sleeping but decided to add my own twist. Here is an ingredient list I used but you can be as creative as you want!! Layer on a pizza pan. Put in 350 degree oven for 5-10 min until cheese is melted and heated through. 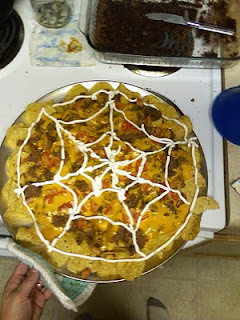 Put about 1/4 cup sour cream in a ziplock bag and snip off corner to make a spider web on top!! Serve and enjoy the yummy nachos!!! I think next time I am going to add some guacolmole:) Let me know what you do with yours!! !